Figure Dynamics: At the contact point of the stride, the shoulder rotates and arm swings in the opposite direction of the leading leg. - Our weight shifts from one foot to the other in a normal stride. - Each time we raise a foot it moves the weight of the body to the opposite side. - Our shoulders and pelvis move to counteract the change in weight. The shoulders oppose the pelvis. - Give more life the the walk by slowing out and slowing in the foot around the passing position. - Exaggerate the lift and angle of the foot as it moves out of the passing position to into the up position. Arm Movements: The arms swing in an arc, like a pendulum, to balance the thrust of the feet. Like the heel, the wrist maintains the arc of action. Example. At the passing position the body rises, the shoulder drops, and the arm is at its lowest point in the arc. 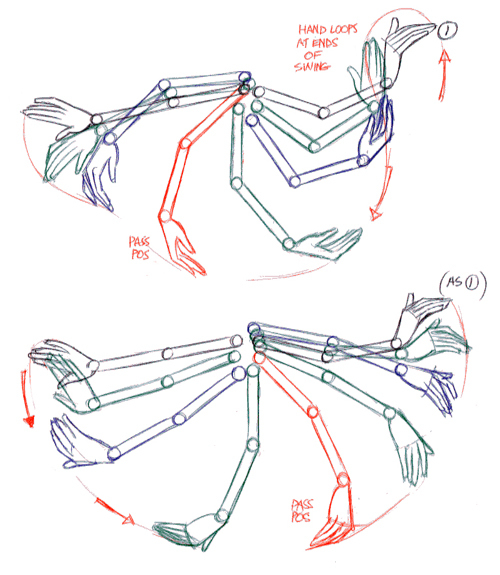 Animators have tricks for creating more interesting and natural arm swings. Arm movements can be broad and exaggerated or restrained, with little movement. 1) Add the belt line to accentuate the change in weight. 2) Create the arm movements. Open the file you started last week. Turn on the onion skinning. On each drawing add the belt line to show the change of weight. Belt line dips down on the contact positions and up on the passing positions. You can create the arms on separate layer. This makes is possible to adjust a separate timing for the arms if you'd like. Start by creating arms for the first step (frames 1-9). The arm swing is like the pendulum, slowing out of the first key frame and slowing into the second. At the passing positions (frame 5) draw the arm with the shoulder in its lowest position, the arm hanging down, slightly bent and the hand dragging behind. Next draw the contact (1, 9) positions draw the arm swinging out in the opposite direction of the leading leg. To emphasis the squash of the down position (3) swing the arms out a little bit wider than the contact position. Bend the wrists here to their extreme rotation in the arc. Use this guide to draw the rest of your arm positions. Or this guide to create more exaggerated motion. Or create your own! Just make sure you maintain the stride and passing position for the arms. On the even frames of your animation create the inbetween drawings on the arms and legs element layers. 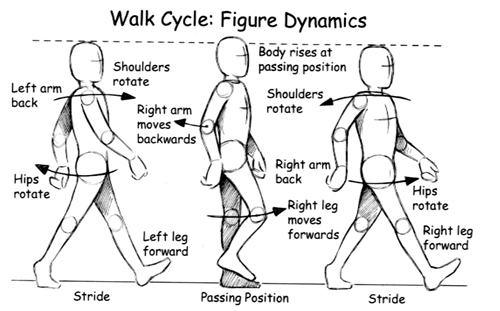 To create a walk cycle we will put each of the final drawings in one new document or layer, called WalkCycle. Each drawing will be lined up using the heel and toe as a guide. Follow this guide. Copy can paste your frames into a new layer. Remember that because frame 17 is the same drawing as frame 1, we won't need it for this cycle, however you might wait until your done to delete it. 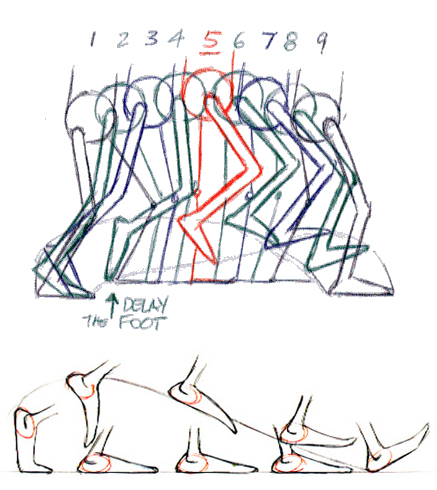 Reposition the drawings so that the toe of the grounded foot lines up with the grounded heel of the previous drawing. It should look as it the grounded foot is gliding along the ground. Add the belt line to accentuate the change in weight. Add all the inbetweens to the legs and arms.